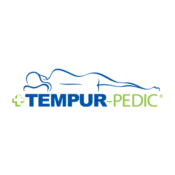 A whopping 41 percent of Americans sleep in the fetal position — on their side with their torsos hunched and knees bent — according to the National Sleep Foundation. And another 15 percent sleep on their sides with their torsos and legs straight. That may be good news, because experts say sleeping on your side can have some health benefits, including helping to prevent heartburn and reducing the chances of snoring. It may also be better for your neck than other positions, according to a report from Prevention. With so many people favoring this sleep position over others, it should come as no surprise that there are plenty of pillows dedicated to side sleepers. I’ve highlighted my top picks below; these pillows should cover a variety of sleep preferences. I’ll also make some recommendations for what to look for if you’re in the market for a pillow that’s suited for side sleeping. 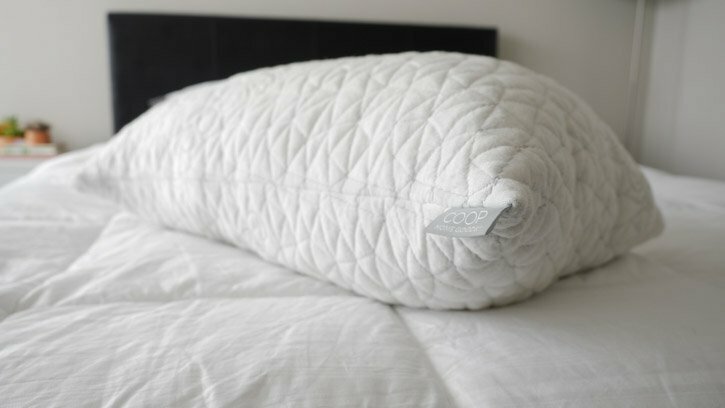 The Coop Home Goods Original pillow is adjustable and you can add/remove as many large chunks of memory foam as needed. The cover is soft and machine washable and the pillow comes overstuffed for extra firmness. The Brooklinen Down pillow in Mid-Plush is a down pillow has a feather core surrounded by down for a plush feel but enough support for a side sleeper. 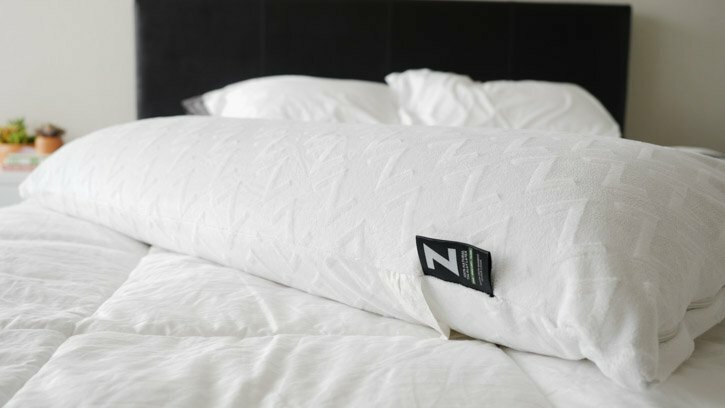 The Z by Malouf pillow is made up of 100% natural Talalay latex (ventilated for breathability). It's light and bouncy with quick responsiveness. It's a great foam option for those looking for a side sleeping pillow that's not memory foam. The TEMPUR-Cloud Breeze Dual Cooling pillow is a large solid piece of Tempur foam (memory foam) that's dense and medium to firm. It has a cooling gel pad on either side that makes it great for hot sleepers. 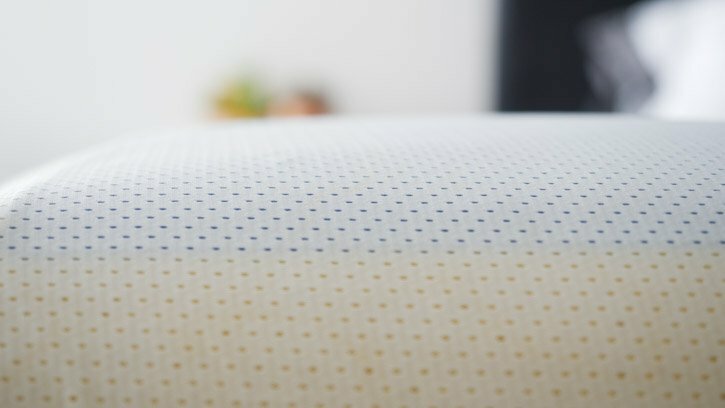 The Beyond Down Gel Fiber pillow from SleepBetter is a polyester microfiber pillow that comes with a wide gusset and plenty of filling to support side sleepers. It's fully machine washable and affordable as well. There are many adjustable, shredded memory foam pillows on the market. What makes the Coop Home Goods pillow so nice for side sleepers are the larger chunks of memory foam within the pillow. These larger foam pieces help give the pillow an overall loft and supportive feel. Since it is adjustable, there is a zipper that allows you to access the filling so you can add or remove as much of it as you like. This will allow each person to find their ideal neutral head, neck, and spinal alignment. To keep the pillow lofted and firm, you will need to put it in the dryer and fluff it on occasion. Read the full Coop Home Goods pillow review. Brooklinen’s Down pillow in Mid-Plush (the pillow also comes in Plush and Firm) is a different kind of down pillow. While it retains its soft and cozy down feel, it doesn’t fall flat as much as a typical down pillow. That’s because it has a feather core that keeps it firm and down surrounding it for added plushness. It’s truly the best fit for some side sleepers and those who sleep in multiple positions. It’s also hypoallergenic and antimicrobial (according to the brand) and has a 60-night trial period. The Z 100% Talalay Latex pillow is a versatile pillow for side sleepers who like the feel of latex foam. It’s available in a variety of sizes, lofts, and densities, including high loft and low loft. The pillow is naturally mildew-proof, dust mite-resistant, and hypoallergenic. The cover is super soft against the side of your face. It’s also removable and washable. I chose the high loft and plush feel and feel like it’s a good fit for side sleepers who need some extra height. The TEMPUR-Cloud Breeze Dual Cooling pillow is a big name for a big pillow. It’s made from a solid piece of memory foam that won’t go flat and is well suited for people with broader shoulders or heavier frames. The cotton cover is removable, machine washable, and dryer-friendly. There are gel pads on either side of the pillow that are cool to the touch and remain cool throughout the night. See our full TEMPUR-Cloud Breeze Dual Cooling pillow review. The Beyond Down Gel Fiber pillow is filled with gel-coated polyester fibers that mimic the feeling of down. Softer filings like these can sometimes be tricky for side sleepers, who tend to need some loft and support for the head and neck. What makes the Beyond Down pillow such a nice fit is that it’s got a large, 4.5” gusset and overstuffed feel. This means your head sinks into the pillow but there’s still enough support to get proper alignment and stay comfortable all night. 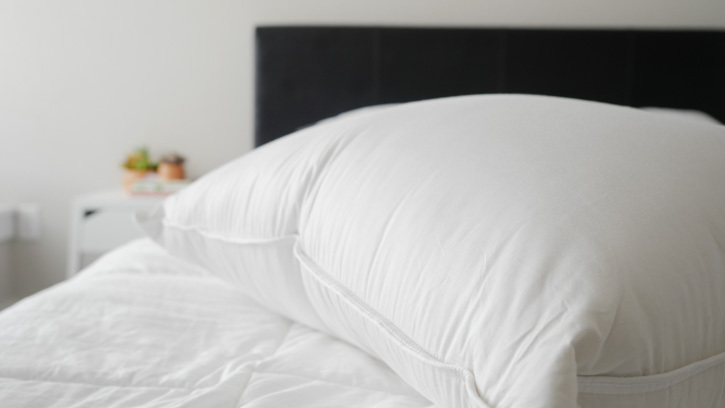 The plus side of using a down alternative pillow is that it’s hypoallergenic, easy to machine wash and dry, and tends to be more cost-effective (in general). Read the entire Beyond Down Gel Fiber pillow review. Picking a pillow that will boost the quality of your sleep is not that different from looking for the right mattress: It’s all about finding something that will promote neutral neck and spine alignment. When your body is properly supported in this way, you will avoid waking up with stiffness and joint and neck pain. The main thing to look for when picking a pillow for side sleeping is something that supports your head and neck but keeps these body parts in neutral alignment with your spine. “Side sleepers need a thicker pillow than back and stomach sleepers to fill the 4- to 6-inch gap in between their shoulder and the mattress,” says Dr. Michael Breus, a clinical psychologist who specializes in sleep disorders, in an interview with Prevention. He says your spine should form a straight line from your nose to your sternum. If it’s hard to tell if your neck is neutrally aligned when you’re using your pillow, have someone take a photo of you from the front. From there it should be clear whether your head is at an angle upward, downward, or in a straight line (as is ideal). Keep in mind that some pillows have fillings that will flatten or change shape during the night. It could be worth finding pillows that offer return policies or trial periods so you can test them out for a few nights before deciding which is a good fit. It’s possible to find the perfect pillow for you if you take the time to do a little research and self-assessment. Think about which sleep positions you find yourself in at night, which materials and fillings you like in your pillow, and what your current pillow is doing for your quality of sleep. If you’re a side sleeper, focus on finding a pillow that supports your head and neck so there’s a straight line from your nose to your sternum — an indication of neutral neck and spinal alignment. Test out different pillows with good return policies until you wake up feeling comfortable and happy. Good sleep is in your future! Years ago I slept on me Feather pillow and I liked it. However I made the mistake of washing it after watching Dr. Oz episode about how gross pillows are. Well it stunk to high heaven after washing it so I had to throw it in the trash. I decided to go with the coop pillow since I’m a side sleeper. However that one stunk straight out of packaging for a good week after I got it. Any suggestions for a non-smelly eco-friendly pillow for a side sleeper? Thank you for your time and input! I’ve given pillow comfort quite a bit of thought. I sleep both on my back and side. When sleeping on my back I prefer a feather pillow (down/feather combination) because I can form the feather pillow to the Contours of my neck to head ratio. The back of the head, it seems, should be nearly flat, while the neck needs extra support – this can be accomplished by grabbing both ends of the pillow closest to your neck and pulling (jamming) a large Mass of the pillow towards the shoulders so that a large portion of the feather pillow will support the curvature of the neck. This is great when you are on your back, but an issue happens when you turn onto your side where your head needs Lift in order to raise the head enough so that you keep your spine in alignment. This is when a feather pillow is not the best since it allows your head to sink down and cause a down curve of your spine in your neck region. Another issue I have when sleeping on my side is the pressure on my ear becomes painful. After some thought trying to figure out how to solve this personal problem, I I figured that some kind of donut-shaped foam pillow that I could place on top of the feather pillow so that I could place my ear in the middle where it would be relieved of the pressure from my head might solve my problem. The solution was one of those horseshoe-shaped foam pillows that are often used for traveling. By by placing the u-shaped formed pillow on top of the feather pillow when I turn to my side I am able to protect my ear from head pressure and at the same time slightly raised my head helping to position a straight spine- it worked. I cannot be the only one who has issues with their ear hurting from the pressure of their head when side sleeping. This may all seeing very odd, but the reality of someone who sleeps both on his back and on his side creates issues for both positions and each one requires a different approach. I slept on my stomach most of my life till I was about 35 or 40 years old at which point I began having neck pains from my head being turned sideways throughout the night. So I learned how to enjoy sleeping on my back, which turns out to be the best overall sleep position since it allows for the most correct spine alignment – however, I think it is necessary to use a feather type pillow that you can adjust to give neck support while allowing the back of the head to lay close to flat, with only slight pressure relief from the down in the pillow. This may all sound very complicated and tiring, but these techniques have worked for me. Overtime, I have also realized the importance and general comfort of using pillows for my legs and armsin different ways depending on whether I’m sleeping on my back or side; when on my back I like to have a supportive synthetic (foam) type pillow under my upper leg to take the pressure of my legs off of my buttocks, which I noticed would hurt after a long night of sleep due to the fact that it protrudes the farthest when sleeping on your back, such that the weight of your legs transfers to this part of my body – but it works, LOL. When sleeping on my side I move the foam pillow to between my legs, for obvious Comfort reasons, and grab a full Bodied feather pillow to rest the dangling upper arm, again for obvious comfort reasons. I enjoyed your explanations and research on the mattresses available – I am pretty sure that one of these would be a good match for me, but not sure which one. I am a lightweight at 138 pounds, so support should not be too difficult. I bet the explanation of my sleep methods at this weight must seem a little extreme to you, but again as I mentioned above, I have given this quite a bit of thought when I realized I could not sleep on my stomach any longer and found the issues I mentioned above to be problematic, however I do believe I have been able to solve them the best I am able, and it has worked out pretty well, but I am interested in your thoughts, so please let me know what you think…. Thank you! thanks for these quick reviews – you do a great job and they are very helpful!